How would you like to win an all-inclusive and unforgettable VIP weekend in Sonoma wine country for you and your 3 best friends? Sounds like my dream come true all thanks to Underground cellars. Underground Cellars is an exciting new online wine marketplace that randomly rewards wine buyers with free upgrades to rare and private-stash bottles from prestigious wineries. For instance, you commit to purchase a $42 bottle of wine - you have a chance of receiving the bottle you initially purchased or you may be a lucky wino with a bottle of $250 cab. No matter what, you get what you pay for - but chances are, you get much more. 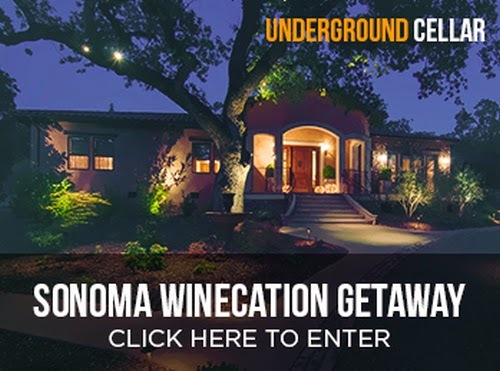 To celebrate the launch of their new website, Underground Cellars is giving away an amazing VIP trip to Napa along with additional prizes. VIP chef's dinner at award-winning "the girl and the fig" restaurant Roundtrip airfare, luxury transportation, and many other surprises!